I end everyday without getting close to completing everything that I would have liked to have that day. Why? Well because I have a 2 year old. A 2 year old who is for sure in her terrible 2s! Every time I start doing something, she gets into something. This is what my computer desk currently looks like because I never have a chance to look at anything, I just throw it on my desk and if I am lucky, I get to go through it about once a month. I plan to go through it today! Hahahaha! We will see if that happens! Last week at Haley's dance class Faith stripped necked,twice. How, oh how, do you keep clothes on a toddler? I have been told that she is Eva Grace Barrett made over! Thursday night ended in tears of stress. I planned to go check out daycares on friday & look for a job! Bradley & I had a long talk and I am feel better today! Or right now anyways, the day is not over! Today has been crazy already and it is just 2. I was thinking that I should write everything down that Faith does in a day and then remembered that I have this blog. So, I am going to blog the events of each day so that I will always have these terrible two memories. I will post the days events every night, starting tonight!! We had some frozen precipitation that started Monday afternoon and some through the night. 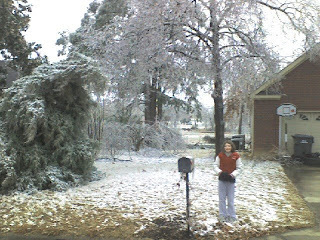 These pictures were taken from Haley's bedroom on Tuesday morning. Bradley hates the 4 pine trees that belong to the neighbors but border our lot because every time the wind blows limbs & branches fall in our yard. 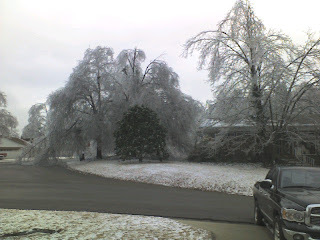 As you can see from these pictures, as always, the limbs are on our side of the trees! It rained off and on during the day on Tuesday. 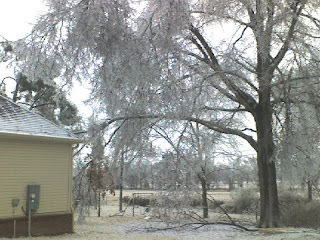 The temperature was so low out that the rain was turning to ice and piling up on the trees & power lines. By Tuesday evening power lines became too heavy and people started losing their power. Ours was flickering during dinner. We knew that it was just a matter of time so we headed out in search of wood for the fire place. Bradley had to stop and cut a bundle of trees down that were crossing the road just so that we could get down the road to get wood. 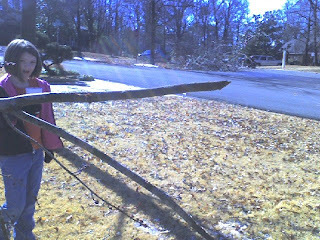 I would have taken pictures of him cutting the trees, but by that time the street lights were out and you could hear trees falling all around but could see nothing. I was asked to stay in the truck. By the time we got back home our neighborhood was a total blackout! We decided the best thing to do was to pile up on our bed and call it a night. The girls had not trouble falling asleep. 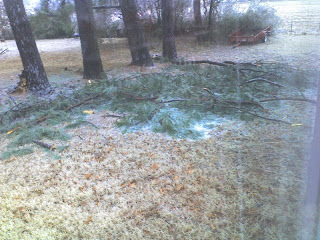 Trees were snapping and falling all around us so Bradley and I could not sleep. I was a nervous wreck. 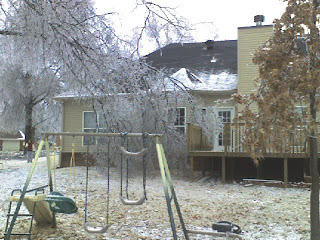 When we built our house, Bradley made sure that we were clear of all tree branches. 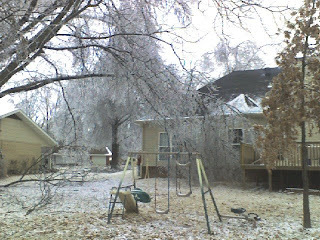 However, loaded down with ice the branches were really close to the house. When the sun finally came up Wednesday morning, this is what it looked like outside. 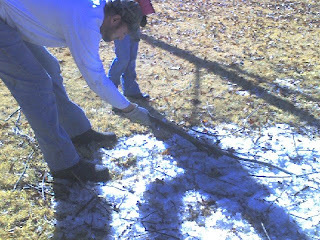 We burned all of our wood by Wednesday evening and not knowing when we may have power again, we went to Batesville. Haley had a slumber party to go to on Friday night, so we left Faith in Batesville and took Haley to her party. Bradley decided since it was just the 2 of us that we would just go to the powerless house and fire up the fireplace to keep warm. 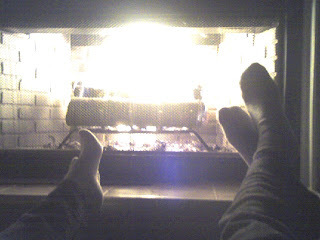 The living room was 68 degrees with the fireplace, so we were fine. We spent the day on Saturday cleaning up the area. It is hard to tell from this picture, but that limb is about 2 feet in the ground. I would not have wanted to be under that limb when it fell. I also spent some time throwing everything in my refrigerator in the trash which was very depressing. I am working on a grocery list so Faith is playing in the kitchen. She pulls a chair over to the cabinet and is digging in a drawer. One of her new things to say is "Haley Cheatham". So, when I hear her say Haley's name I do not think much about it. But then I hear, "Daddy Cheatham, Mommy Cheatham, Baby Cheatham"! I look over and she has 4 medicine cups out of the drawer! I still think of her as such a baby, but she is really turning into a smart little girl! I am amazed to watch how quickly she learns knew things! Amy and Ashley had a craft day today at Amy's house and I dropped by to deliver some pants and pick up Faith's Valentine shirt and this group just can not be together at meal time and not go grab some food, so we all headed to Tamolly's! The girls discovered that it was a ton of fun to throw money into the fountain and they drained all of us of our coins. It was so funny to watch them! They would throw their money and then sprint back to whoever might have money in their hand! Haley got a new jewelry box for Christmas and Faith was great help putting all of the jewelry in the new box. Haley put nearly every piece of jewelry that she owned on Faith. Bradley and I were in our bedroom and Faith would run and show us each piece as Haley put it on. These pictures are about midway through. In the end she had at least one ring on every finger and about a dozen necklaces and bracelets. I tried to get a picture of the girls together with all of the jewelry on, but Faith decided to be uncooperative by that point! Bradley's parents remodeled their house about 4 years ago and we really liked the tile that they used for their under cabinet area. When we started building our house 3 years ago they gave us the left over tile which happened to be to the tile exactly what we needed! We designed our whole kitchen around the colors in these tiles! We moved in May of '07 and here it is 2 1/2 years later and the tile is finally up! Now, if I can just get that white frig out and replace it with a stainless steel then my kitchen will be totally complete as planned out 3 years ago! Too bad those things are so expensive. I will just have to save my money!